Tempura is one of the best Japanese deep-fried dishes. 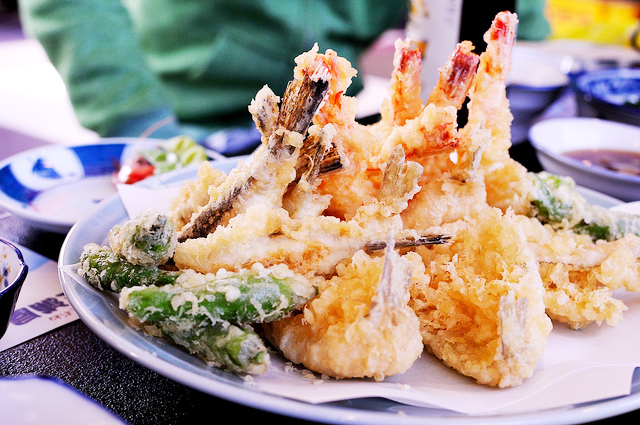 The crispy vegetables, fish, and shrimp are a classic of Japanese cuisine and not to be missed! Our writers share tasty recommendations for tempura in Tokyo and Yokohama. Visit this specialist tempura restaurant in the center of Tokyo and try the tendon - fresh hot tempura on top of rice. Tempura Motoyoshi in Tokyo Minami-Aoyama is a tempura specialty restaurant that only uses the finest of ingredients possible. Treat yourself to Japanese fine dining. Watch the chef at this old Yokohama restaurant prepare fresh tempura. Try the tempura teishoku set with shrimp, vegetables, rice, and miso soup. Want to eat Tempura at a reasonable Price? Here's How!! Tempura does not have to be expensive. Here is how to eat tempura at reasonable prices even in the city. Crispy crunchy tempura on rice is simply delicious! Before you leave Japan, have some at Tokyo's Haneda airport. Shrimp and vegetable tempura is freshly cooked upon order.